If people open your project file, they may accidentally change task status, deadlines, or other critical information. You can prevent that by adding a password to the file when you save it. Pick a place to save the file — computer, OneDrive, or a website — and then click Browse. In the Save As dialog box, click Tools > General Options. Protection password: People need this password to open the file. Write-reservation password: Anyone can read the file, but only people with this password can make changes. 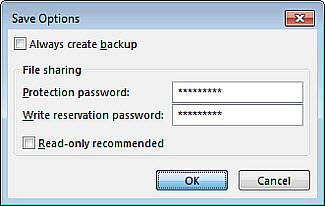 Retype the passwords in the Confirm Password dialog box, and then save your file. Tip: Use strong passwords — the longer the better. Mix uppercase and lowercase letters, numbers, and symbols. Project Web App automatically adds security to project files, so you don’t have to add a password to files you store there.